Smooth, sweet and velvety. This awesome tasting red velvet cake seem to just melt in your mouth. This recipe can be used for one 9" cake or 12 cupcakes. Preheat the oven to 350oF. Grease a 9” pan. Cream the butter, vanilla and sugar together. Gradually add in the eggs and red food coloring, while beating. Slowly fold in this flour mixture. Until it is all blended in. Grease a 9" cake pan. Pour the batter into the pan. Bake in the oven for 60 mins, or until an inserted toothpick comes out clean. Cool on a cooling rack for at least 30 minutes before frosting. Line the muffin tin with muffin cups. Pour the batter into the cups till ¾ full. Bake for 35-40 mins or until an inserted toothpick comes out clean. Place all the frosting ingredients in a bowl and whip it up. Use the frosting immediately. Cake: Frost the bottom layer, place the next layer on top and front the top and the sides. Sprinkle with the remaining cake crumbs found in the cake tin. 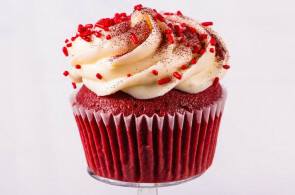 Cupcake: Place frosting into a piping bag with a flower tip. Pipe a big swirl on top of the cupcake and sprinkle with cocoa powder and red sprinkles. After frosting, leave it in the refrigerator for 4 hours before serving. Ingredient statement: Butter, brown sugar, powdered sugar, cake flour, cream cheese, eggs cocoa powder, red food color, vanilla extract, baking powder, salt. Question on preferred baking powder… differences noticeable between brands? Does using a reduced sodium aluminum free powder alter anything from old basic baking powder used in household for ever? Check out our Baking Powder Page for more info!